Those with interest in magnets have no doubt heard about neodymium magnets. Perhaps they would want to know what are neodymium magnets and why are they so important. These are a type of magnets made using rare earth metals. They are quite strong, and they can be dangerous if they are not handled properly. They are also often referred to as rare earth magnets since they are made up of rare earth elements of the periodic table. However, they are not rare earth magnets; neodymium magnets are just one type of rare earth magnets. Today, these are the strongest permanent magnets known to man. They are also known by the name Neodymium-Iron-Boron shortened to Nd-Fe-B or NIB super magnets. Despite being small, they are extremely powerful, which makes them quite useful for many industrial purposes such as making electronic parts. How Are Neodymium Magnet Made? Everyone should know how these magnets are made. However, not everyone has a degree in chemistry. The process has been broken down into the most basic principles so that even those without a chemistry degree can understand what it entails to make neodymium magnets. The main ingredients used are neodymium, iron, and boron. However, these are not the only ingredients used. Some manufacturers will add other ingredients such as aluminum, dysprosium, niobium, and praseodymium. These materials are used to replace some of the neodymium, which helps to make magnets affordable for different commercial purposes. The ingredients needed to make the magnet are placed in a vacuum induction furnace where they are heated and melted to create an alloy. The mixture has to be cooled down, whereby it forms ingots. These ingots are then ground into fine dust inside a jet mill. The grains are usually finer than red blood cells. The fine powder is now pressed into a mold while being infused with magnetic energy at the same time. This magnetization is done using a coil of wire. The wire produces a magnetic current when a current goes through it. As the dust is being pressed, the direction of magnetism is locked into it permanently. If the particle structure of a magnet matches the direction of magnetism, it is known as an anisotropic magnet. At this stage, the magnet is demagnetized. It will be re-magentized at a later stage of the process. At this point, the mold would be too soft and would crumble if it were used. Thus, it has to be heated until it reaches just below the melting point. As a result, the powder particles will fuse together. The process has to be done in an oxygen-free environment to prevent any oxides from being formed. 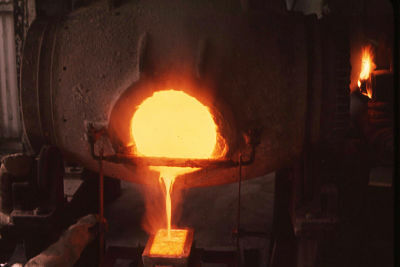 The hot molds now have to be rapidly cooled using the quenching technique. By rapidly cooling the hot molds, it reduces the areas on them, which are prone to poor magnetism. It also helps to maximize magnetic output from the mold. At this point, the molds are machined into various shapes. However, since they are so hard, they have to be cut using diamond-tipped tools. It is a delicate process, which is usually done using super computers to minimize wastage. This is the most important step before the neodymium magnets can be magnetized. Since they are so hard, this makes them prone to chipping and breaking. To mitigate these problems, the magnets are cleaned, plated, dried, and coated. Many types of materials are used to coat these magnets. However, the most common one is nickel-copper alloy. It gives the magnets that extra boost of strength that they require to survive. Sometimes even rubber is used to coat these magnets. After being plated, the magnets go through a process of magnetic induction. They are placed inside a coil, through which a powerful current is run through. It results in the magnet acquiring three times more magnetism than is required for its use. This process is so powerful that if the magnets are not secured in place, they can be ejected from the coil at the speed of a bullet. Why Are Neodymium Magnets the Strongest? Neodymium magnets are renowned all over the world for being the most powerful magnets. In fact, it is advisable to keep it as far away as possible from credit cards and other electronics. It could cause permanent losses of data and even damage to the equipment. For those who do not understand magnetic forces, they may not really grasp why these magnets have so much power. Here is a simple breakdown for them about magnetism. A good place to start is electromagnetism. This is basically a situation where magnetism is generated because of an electric current. In fact, any wires that transmit current also result in magnetism. The reason for this is that the movement of electrons leads to a magnetic field, which can attract other electrons. A magnet can only attract certain types of metals such as iron, nickel, and cobalt. All of these metals have an unpaired electron in the outer orbit. These electrons align with the magnetic field. When these single electrons are spread throughout a piece of metal, these electrons are what pull the metal towards a magnet. The metals can be temporarily turned into magnets whenever they are exposed to a magnet. This exposure causes the electrons to align and spin in a certain direction. For a permanent magnet, the electrons remain in the same spin in a given direction. The best example of this material is neodymium. Neodymium is a rare earth material, but the magnets themselves are made of three elements. The elements of iron, boron, and neodymium combine to form a tetragonal crystalline structure. The structure formed has extremely high uniaxial magnetocrystalline anisotropy. This anisotropy has been measured at as high as HA˜7 Tesla. In simple terms, the atoms of a neodymium magnet are perfectly aligned in a way that ensures the electron spin stay in one permanent direction. This is what causes the magnets to have such a strong magnetic pull. The research into these magnets began as a way to find cheaper materials for making permanent magnets. At the time, samarium cobalt was in wide use, but it was also quite expensive. With neodymium being the third most abundant rare earth metal on earth, it makes it much cheaper compared to using other rare earth metals. Magnets technology in fishing is the practice of using neodymium magnets to look for ferrous items hidden or lost in the water. If you think there might be something valuable at the bottom of a lake or a pond, this is a great way to pass the time. The magnets will usually come with a hook or a hole where you can attach a rope. You simply need to throw it in the water and pull it upwards. Since it is so powerful, it can pull out even heavy objects that an ordinary magnet can not manage. Some of the most common places to use magnets for fishing are at the docks or at a busy pier. It is especially so if the place has been occupied by humans for hundreds of years. If you are lucky, you may fish out a valuable artifact with something expensive attached to it.